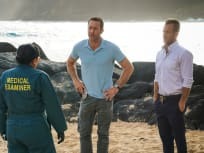 "He kama na ka pueo (Offspring of an Owl)"
"Ke Ala O Ka Pu (Way of the Gun)"
On Hawaii Five-0 Season 9 Episode 20, Five-0 locates a teen girl who purchased a gun from a junkie and learns that the firearm has affected all of their lives. 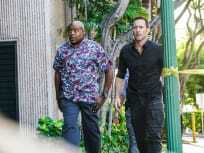 On Hawaii Five-0 Season 9 Episode 19, Five-0 investigate the murder of a window washer/street artist and who may have had a politically motivated bounty on his head. "Ai no i ka 'ape he mane'o no ko ka nuku (He who eats 'ape is bound to have his mouth itch)"
On Hawaii Five-0 Season 9 Episode 18, Tani and Junior go undercover at a gym to track down a deadly batch of steroids that is killing its users. 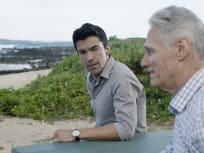 "E'ao Lu'au A Kualima (Offer Young Taro Leaves To)"
On Hawaii Five-0 Season 9 Episode 17, Junior is torn between the team and his former girlfriend when her new love is a suspect in a bank-heist-turned-homicide. "Hapai Ke Kuko, Hanau Ka Hewa (When Covetousness is Conceived, Sin is Born)"
On Hawaii Five-0 Season 9 Episode 15, a hurricane hits Oahu and Five-0 must protect El Diablo, a captured serial killer who is being hunted by an assassin. 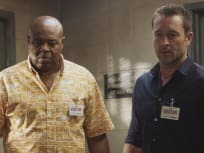 "Ikliki I Ka La O Keawalua (Depressed With The Heat of Kealwalua)"
On Hawaii Five-0 Season 9 Episode 14, Grover has an emotional reaction when he and McGarrett uncover a deadly plan by an extremist group on the Island. "Ke Iho Mai Nei Ko Luna (Those Above Are Descending)"
"Ka hauli o ka mea hewa 'ole, he nalowale koke (A bruise inflicted on an innocent person vanishes quickly)"
On Hawaii Five-0 Season 9 Episode 12, Danny and Rachel are left reeling when Grace gets into a life-threatening car accident and lands in critical condition.